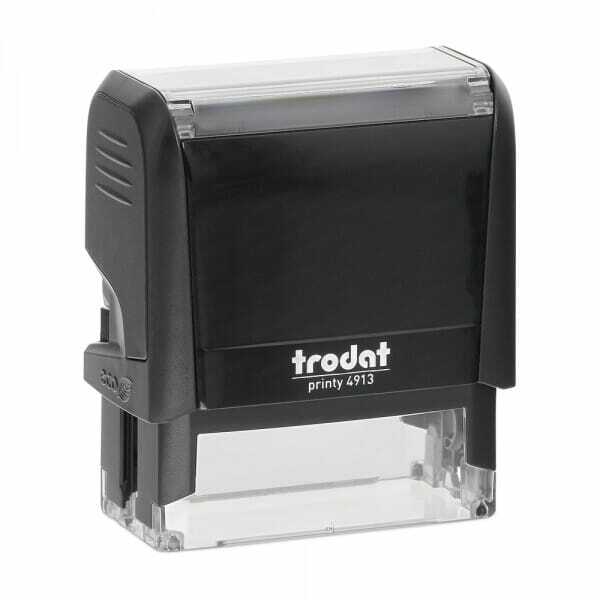 The Trodat Printy 4913 self-inking stamp has a maximum text plate size of 7/8" x 2-3/8" - (22 x 58 mm) allowing you to create up to 5 lines of customized text. This versatile stamp is perfect as a notary stamp. You can upload your own logo or artwork in our stamp wizard! The Trodat Printy contains post-consumer plastic and is a climate neutral product, so you can feel good about helping the environment. The crystal clear viewing window ensures ultra-precise positioning of the impression. Running low on ink? Changing the ink cartridge is simple and clean thank to the special grips that help you avoid touching the pad itself. Customer evaluation "Oklahoma Notary Self-Inking Stamp - 7/8 x 2-3/8"